This June, Art at the CAVE welcomes the work of Mar Goman and M. Acuff. Goman’s work often references the interior journey, invisible wounds, common humanity, and the process of becoming authentic spiritual human beings. Acuff is greatly focused on the aesthetic, ecologic, and material that define the period in human/geologic history now known as the Anthropocene. Join us June 7th from 6-9pm for an opening reception and opportunity to meet the artists. The exhibit ends on June 28th. 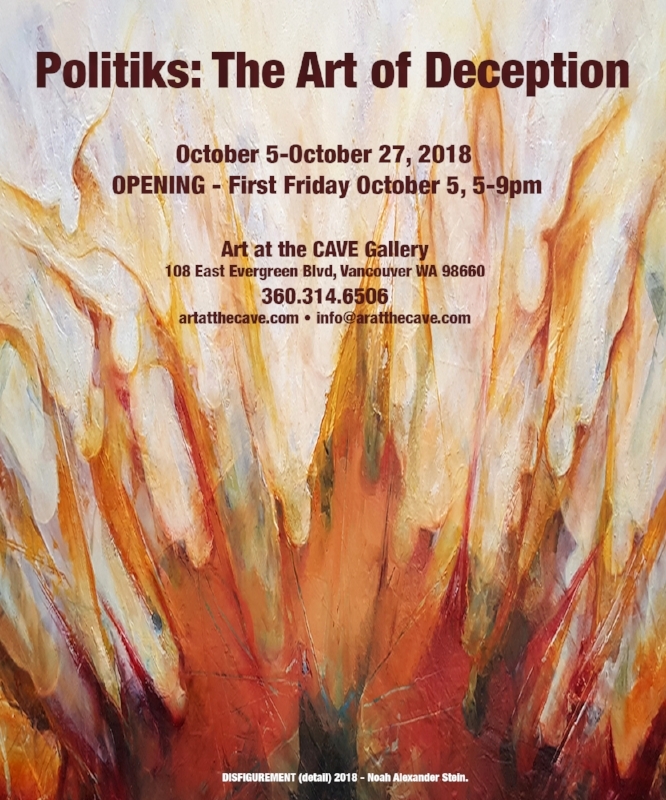 Art At the CAVE welcomes Chuck Moffit to Vancouver, WA during a month long exhibit this April. A designer from Mount Baldy, California, Moffit’s works challenge conventional assumptions of gender, history and materials. The exhibit kicks off with an opening reception, April 5th from 6-9pm. Then on April 10th at 4pm, we’re hosting an Open House as part of Design Week Portland. Moffit will conduct a demonstration followed by a talk and question/answer. There is no charge for attendance to the gallery or events. Chuck Moffit tears down masculine forms and rebuilds them. He works in a light-filled Modernist studio hidden behind a boulder in the woods of Mount Baldy, California. Inspired in equal parts by the rugged tactility of artist Richard Serra and the transgressive purposefulness of fashion designer Hussein Chalayan, Moffit’s designs challenge conventional assumptions of gender, history, and materials. Moffit's practice keenly rides the contemporary design and sculpture divide. His work has been in exhibitions throughout Los Angeles including: Hammer Museum, Christopher Grimes Gallery, Blackman Cruz, Eric Buterbaugh Gallery, and the Torrance Museum of Art. He has collaborated on site-specific installations for High Desert Test Sites, organized by artist Andrea Zittel. 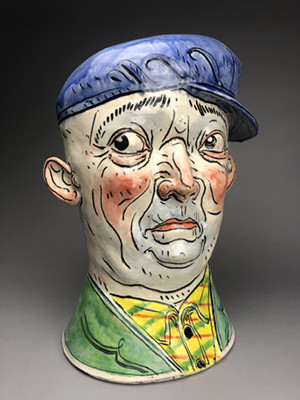 Moffit received his MFA from Claremont Graduate University in 2000, and an Arts/Industry residency at the John Michael Kohler Arts Center in Wisconsin. His work has been celebrated in such publications as Architectural Digest and T Magazine. Visit the magnificent Toby Town this March at the CAVE. 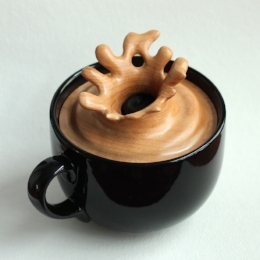 Ryan Kelly is an Assistant Professor of Ceramics and Foundations at Western Washington University. 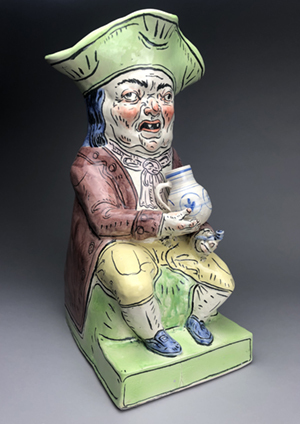 For this exhibit, Kelly puts his own spin on the decorative Toby Jug or face mug, and invites you to meet the various characters of Toby Town during a lighthearted jaunt into the marvelous world of Bric a brac. Join us for an opening reception March 1st from 6-9pm. Dive into a deluge of aqueous themed art during our February exhibit Aqueous: a group show featuring artists Theresa Biagioli, Robert Bickel, Steve Eichenberger, Michael Smith, Alder Suttles, Anne John, kathi rick and Sharon Svec. The show runs February 1st thru 22nd, with an artist reception on February 1st from 6-9pm. Bead artist Theresa Biagioli (“Koi” pictured above) was raised in the Pacific Northwest, and though she now lives in Virginia, she continues to draw inspiration from the natural environments of the West Coast. The bead work in her current exhibit was inspired by a visit to the Oregon Coast Aquarium in Newport where she encountered a tank full of delicate Sea Nettles— jellyfish characterized by a large bell and long, dangling tentacles. Theresa has also taken an interest in beading koi fish, exploring the variety of colors and intricate fin structures. Theresa’s bead weaving technique employs a variety of stitches to create a bead fabric. She alters the stitches to influence the rigidity and fluidity of the bead fabric to best match the needs for the bodies, fins and tentacles of her sealife creations. 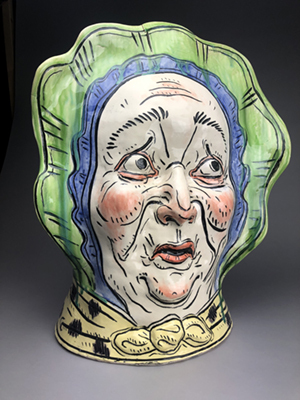 Other themes have focused on basket forms, vases, tea sets, flowers and traditional costumed characters. 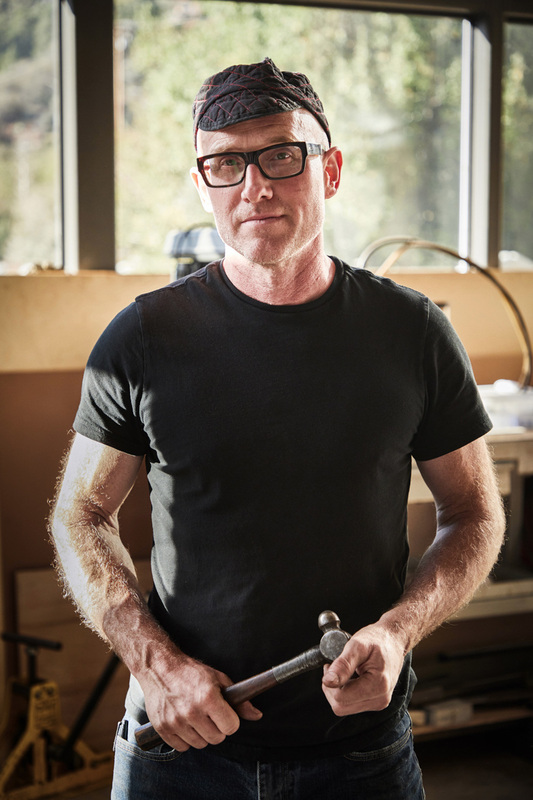 Michael Smith is an artist and art educator currently residing in Vancouver, Washington. He received his Bachelors in Art Education and Graphic Communication from Eastern Washington University in 1996. Since then, he has focused his artistic energy on printmaking and oil painting, exploring emotional aspects of everyday life. Alder Suttles (“Untitled” pictured above) has shown her work in venues across the country. She received her bachelor of fine arts from Maryland Institute College of Art and her Masters degree from School of Visual Arts. Art At the CAVE is pleased to present Erin Dengerink, Don Gray and Jason Mayer in January’s exhibit, The Nature of Things. Each artist explores landscape, objects, and figures in a poetic and thoughtful ways; seeking beauty and hope in a complicated world. The show will include Gray’s painting, monotypes by Mayer, and Dengerink’s paintings, sculptures, and an installation that incorporates a soundtrack by artist/drummer Melissa Gueiros. A limited edition book with images from each artist and an essay by Renee Marino will also be available. Please join us for an opening reception January 4th from 6-9pm. Don’s art has tracked parallel courses, alternating between paintings that are firmly within the realist tradition and works that are less literal, leaning more toward the abstract. This December, journey with kathi rick and John Tylczak into the great wilderness of our hearts and histories. 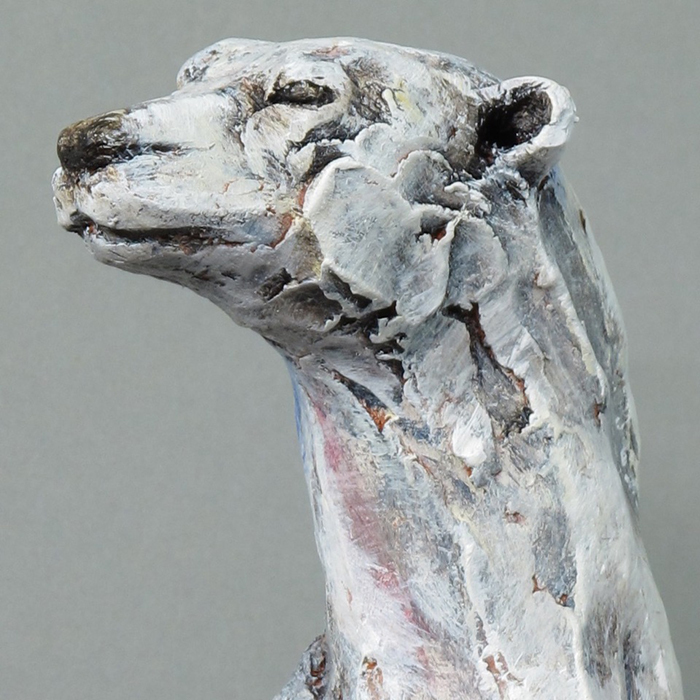 Influenced by personal expeditions into the great northwest, rick and Tylczak invite you to view their works and visit during an opening reception on Friday, December 7th from 6-9pm. The exhibit continues through to December 29th. kathi rick presents "I Dress Myself in These Things Now," which feature larger-than-life, sculptural self-portraits as well as a video exhibit of the wilderness experience. John Tylczak documents the old logging camps of the Northwest. “Chasing Ghosts” shares the history of the Northwest loggers through Tylczak’s photos and new book. Please join us to appreciate the work of visual artists Michelle Allen, Wendy Armstrong, Rachel Aponte, Marthe Aponte, Erin Dengerink, Lesley Faulds, Bea Garth, Mar Goman, Cynthia Heise, Anne John, Linda Kliewer, Carson Legree, Michelle Marusek, kathi rick, Sharon Svec and Crystal Zeller. There will also be special guest appearances by Sumona, Monica, Barbara, Nala, Pamela, and Rakayia – belly dancers from across the PNW. Performances at intervals throughout the evening of September 7 between 5pm-9pm at The CAVE Art Gallery. The CAVE is located at 108 E Evergreen Blvd., Vancouver, WA 98660. How does a civilization's concept of sin and evil influence or express itself in fine art? What is sin? What isn't? Who cares? How do we define “Sin”? The Seven Deadly Sins: pride, greed, lust, envy, gluttony, wrath and sloth are behavioral but are they amoral? Is anything intrinsically ethical, or righteous or evil in reference to some universal code? No deity, no sin? Does that mean no right or wrong; nothing moral or immoral? Is there good karma and is anything taboo? 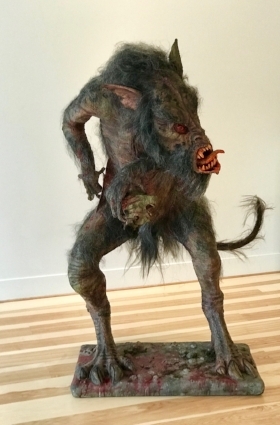 Art at the CAVE opens its doors to “Sin?”, our freshest exhibit yet at Vancouver's newest art gallery. 108 E Evergreen Blvd., Vancouver, WA 98660. Opening exhibition starts 5pm August 3, 2018 and continues through September 1, 2018. First Friday opening events and the opportunity to meet the artists August 3 from 5pm-9pm. Regular gallery hours are 10am-4pm Tuesday-Saturday. This is a juried show featuring artists Michele Collier, Jessica Damsky, Kayla Griffin, Cynthia Heise, Anne John, Clarice Keegan, Ryan W. Kelly, Bill Leigh, Meredith Lewis, Marc M. McVey, Alan Rose, Ruth Ross, Sally Sellers, Noah Alexander Isaac Stein, Dale Strouse and Samyak Yamauchi. The subject is SIN..
Alessandra Genovese is a mixed media artist working in analog film, digital film, and sound to collage multidimensional spaces. Anara Gillock's work focuses on her observations, in black and white, of life in the city. Jenny Olsen is a photographer who has turned her journeys into a love affair exploring various desert landscapes. Featuring the art of Chas Martin and Melissa Monroe. Mirrors: Seeing our reflection in the familiar unknown. Chas Martin will share insights as well as his own questions about his archetypal masks, sculptures and paintings. 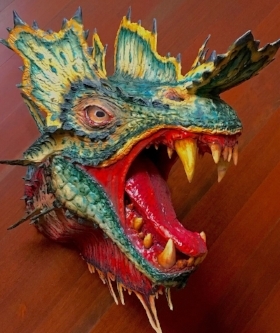 Join Pacific Northwest Sculptors as they host the 4th annual International Sculpture Day at Art at the CAVE. SCULPT / Alchemy in 3D celebratres sculpture with multiple activities including a month long exhibition and an evening event on Saturday April 21, 2018. For more information on the events, check out our calendar. REFLECT exhibition featuring works from three Portland based artists, Abra Ancliffe, Brandi Kruse, and Yoshihiro Kitai. Each artist uses the exhibition title REFLECT to show how they express and present their work conceptually, intellectually and spiritually combined with process, and artistic mastery of the mediums used. 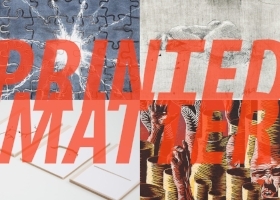 PRINTED MATTER is a group exhibition featuring artists selected from Pacific Northwest College of Art students. Artists are Madeleine Barbier, James Fink, Neal McCormick, and Sydney McLeod. December 2017: Wear and Tear featuring Sam Cobb, Matthew Hopkins, Ugo Serrano and Chris Walas.